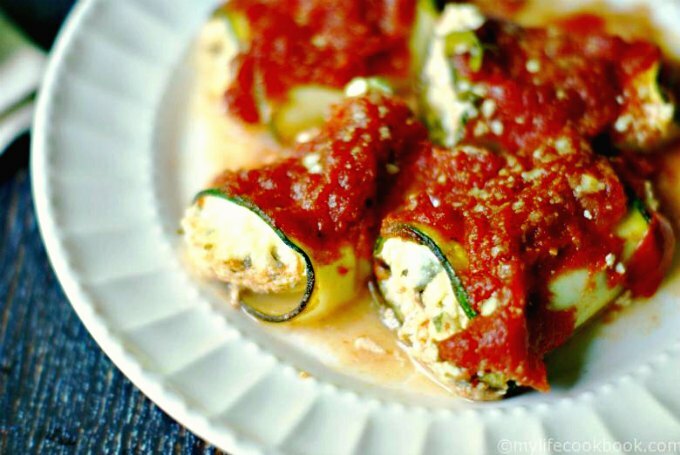 These herb stuffed zucchini rolls are similar to a cheese stuffed ravioli or manicotti but without the pasta. It’s a delicious gluten free, vegetarian meatless meal! The herbed cheese goes perfectly with the marinara sauce and best of all this recipe only take a few minutes to prepare. And if you don't feel like rolling up the zucchini slices. then you can simply lay it down in layers and create a veggie lasagna of sorts. This recipe is gluten free and will definitely fulfill your craving for Italian food. 2-3 cups Cucina Antica Tomato Basil cooking sauce ( Or a marinara of your choice that has no added sugar. Make sure to check the ingredient label). Lay the zucchini strips out across a cooling rack (cooling rack allows the excess water to drain). Sprinkle salt across the tops of the zucchini. Pat the water off the zucchini and then flip them over and repeat with the next side. Wipe off excess salt with a towel. Another option is to grill the zucchini before rolling up. You can do this on the stove top, or in the oven on a cookie sheet. In a medium bowl mix ricotta cheese, basil, mozzarella, and egg. Stir well. Spread 1/2 cup marinara on the bottom of the casserole dish. Lay out the sliced zucchini noodles and spread about 2 tablespoons of the ricotta mixture over each individual zucchini noodle. Add a spoonful of the sauce over the top of the ricotta. Carefully roll up the zucchini and place in the casserole dish. Spread extra sauce over the top of the rolls. Sprinkle Parmigiano-Reggiano on top. Bake for about 45 minutes or until the cheese on top is nice and golden brown.